Every quarter, In-Context, a discussion group on issues of race and diversity, meets for 10 weeks. It’s a unique expression of SPU’s commitment to reconciliation. “It allowed me to approach hard conversations with more grace — loving myself and loving anyone else coming to the table,” says Emilio Cabrera ’14. Value. There are perhaps as many ways to define value as there are colleges in the United States. Value is a word and concept that can be broadly defined while personally interpreted. Perhaps this is one reason why I have always loved going to auctions, and perhaps it’s why I enjoy eBay. In an auction, the price of an item is directly related to the value ascribed to it by any particular person. If the price becomes higher than the value ascribed, individuals will cease bidding. Although they may still want to acquire the item, they are not willing to pay its price. One thing is for sure: The economics of higher education have become complicated. Students and their families now have to understand and assess factors such as nominal versus real value (taking inflation into consideration), the unique basket of goods purchased by colleges and universities that contribute to the cost of education, various student aid and scholarship opportunities and the interplay between them, and many other factors. All of these factors contribute to the net price a student pays — the total cost of education, minus any grants or scholarships. The other side of the economic coin relates to the value graduates gain as they enter the job market. Beyond the national conversation related to the cost of higher education are the reports that illustrate a college graduate’s earning power is much higher than that of a high school graduate as well as a much lower unemployment rate (currently 2.9 percent). So, economically speaking, there is a utilitarian value in obtaining a bachelor’s degree. 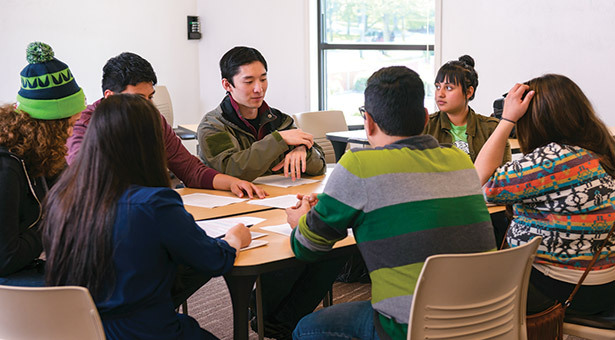 Seattle Pacific University’s value has been recognized year after year in U.S. News and World Report in the “Best Colleges — Best Value” rankings. This year we were ranked No. 4 in the West region, which includes 130 institutions from Texas to Hawaii. In this measure, U.S. News accounts for a school’s academic quality and the net cost of attendance for a student who received the average level of need-based financial aid. At SPU, though, we go beyond economics when defining our value. Not only do we provide the quantitative value necessary to make a living, our philosophy of holistic education also provides qualitative value that prepares our students and alumni to make not just a living, but a life. The core of our value is found in our mission statement, where we say that SPU exists to graduate people of competence and character, becoming people of wisdom, and modeling gracefilled community. It is a mission that has shaped our institutional identity and our value proposition since 1891. That is, we will not only prepare students to achieve great success at the highest levels of their profession, but our holistic educational philosophy will also encourage and challenge them to go beyond personal success to live lives of influence and significance. Creating value both for living and for life is Seattle Pacific's objective. KNOWN AS a premier Christian university that is orthodox, evangelical, Wesleyan, and ecumenical — selected by students able to excel at the highest academic levels, shaped by distinguished teachers and scholars, noted by a distinctive and diverse living and learning environment that reflects its Christian identity, and resourced with significant capacity to realize its mission and pursue its vision. KNOWN FOR preparing students for service and leadership by fostering holistic growth through rigorous academic study, character formation, and vocational preparation that establishes a foundation for a thriving, faithful, and meaningful life. KNOWN BY the lives of alumni who reflect the University’s value, are shaped by its mission, and embody its vision and commitment to global and cultural engagement, reconciliation, and human flourishing. Creating value both for living and for life is Seattle Pacific’s objective. We will be measuring our work through a complement of strategic vision metrics that will form and frame our future development. These measures include items such as 75th percentile SAT scores, six-year graduation rate, and endowment growth. We are using instruments such as the Collegiate Learning Assessment to measure growth in learning, and the Personal and Social Responsibility Inventory to assess development in ethical and moral reasoning and action. Some of the data will be easy to track and interpret, while other data will be challenging to secure — but we are committed to finding that information and sharing it with the SPU community by placing the results on our website. It is my belief our results will only enhance SPU’s value proposition. The national recognition and ranking by U.S. News and World Report of SPU’s value is rewarding, but we are striving to ensure our value proposition is enhanced and furthered — not only to produce a successful living for our graduates, but also a significant life. Daniel J. Martin is Seattle Pacific University's 10th president. You can follow him on Twitter @SPUPres.